On Becoming Preschoolwise talks about two important words to help keep your preschooler doing what he should be doing: What and Where (page 94). You start by deciding what your child should be doing and where he should be doing it. 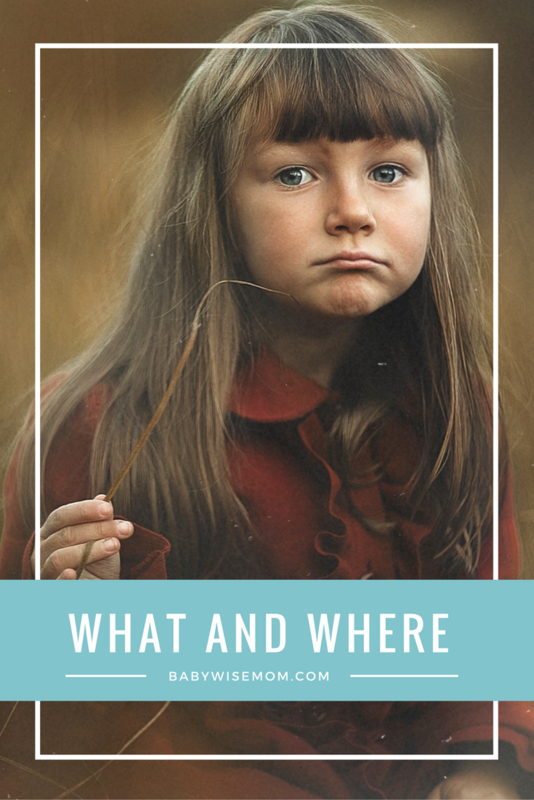 And when your preschooler starts to stray from the what and where? You simply ask one of two (or both questions): What are you supposed to be doing? (wait for answer) Where are you supposed to be? (wait for answer). “The what and where questions will help your child take ownership of what is expected without constant reminders from Mom” (page 94). Now to finish up with this practice in reality. It sounds nice on paper, but of course your child will come up with his own responses that weren’t in the book. If your child is like Brayden, he might respond, “I don’t know.” Hmmm….here is how I work past the “I don’t know” answer. I don’t know again removes responsibility from the child, so we want to avoid it. You might be a “yes, mom” sort of gal and think this will prevent all problems…perhaps so, but perhaps not. This is what I do. I give the instructions. I then ask Brayden what I just said. Often times, even after he has “yes, mom”ed me, he can’t really repeat what it is I said to him. So I tell him to listen carefully. He does, and he repeats the instructions the next time. I like this a lot. I've been using it more often with my 3-year-old because he gets distracted in the middle of projects or tasks, and I KNOW I don't want to take the responsibility by nagging him. It works well with him, but I am also going to take what you said about immediately asking what and where he is supposed to do and be. That will smooth out the whole process.